As well as publishing its own books, the FrameCharge Press offers a selection of print design and production services for both individuals and organisations. Well-written text, good grammar and correct formatting make reading easy, and aid understanding of complex topics. Conversely, a poorly constructed sentence is a distraction, interrupting a reader's train of thought. Good copy should by definition go largely unnoticed by the reader, but it's often much harder to create than you might think. Here at the FrameCharge Press, we use editors and proofers who have been professionally trained, and who have many years' experience in a professional publishing environment. Prior to page layout, all text is edited for language and grammar, the factual content is checked for accuracy as far as is possible, and the structure of the text is made consistent. 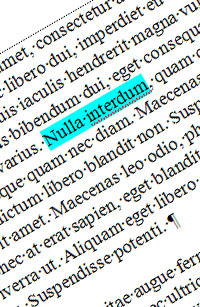 Once the proofs have been returned by the customer, a second proofer will read through the text in order to eliminate any last errors and add a final polish. Does your work contain literature citations? No problem. We'll check them as far as is possible, and format them in the accepted manner to assist your readers.